Indian navy says its frigate attacked a pirate "mother vessel"
(CNN) -- An Indian warship has exchanged fire with a pirate "mother vessel" off the hijacking-plagued Horn of Africa, leaving the ship ablaze, an official said Wednesday. 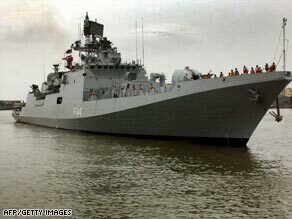 A file photo shows the Indian frigate Tabar, which was involved in the skirmish. Indian naval spokesman Nirad Sinha said: "Given the condition we left it in, it would have sunk by now," he said. The skirmish took place Tuesday evening about 326 miles (525 kilometers) southwest of Oman's Salalah port when the frigate INS Tabar spotted a suspected pirate ship with two speedboats in tow, India's Defense Ministry reported. Capt. Pottengal Mukundan, of the International Maritime Bureau, in London said: "The pirates have been operating with impunity in these waters, and it is time now, it is well overdue that we send a signal to the pirates that they cannot conduct these criminal operations without sanction." The defense ministry said in a written statement: "This vessel was similar in description to the 'Mother Vessel' mentioned in various piracy bulletins." Three other vessels have been captured since then in what a London-based maritime official called a "completely unprecedented" situation. The Saudi owners of a hijacked oil supertanker carrying an oil cargo worth up to $100 million, which pirates Tuesday anchored off the Somali coast, said they were negotiating with its captors. Saudi Foreign Minister Prince Saud al Faisal said he could not confirm if a ransom had been demanded, but said the owners of the 300,000-ton Sirius Star were "negotiating on the issue," The Associated Press reported. In its clash with the pirate vessel, the Tabar's crew hailed the ship and demanded it stop for inspection, and the pirates threatened to destroy the Indian ship, the ministry reported. "Pirates were seen roaming on the upper deck of this vessel with guns and rocket-propelled grenade launchers. The vessel continued its threatening calls and subsequently fired upon INS Tabar," the ministry said. The Indian frigate returned fire, setting the pirate ship ablaze and setting off explosions on board, the statement said. Two speedboats in tow behind the ship fled; one was found abandoned after a pursuit by the Tabar. On Tuesday, pirates hijacked a Thai fishing vessel and a Chinese-flagged Iranian cargo ship carrying wheat in the waters off the Horn of Africa. Noel Choong, who heads the IMB's Piracy Reporting Center in Kuala Lumpur, Malaysia, said 95 pirate attacks have taken place so far this year in the Gulf of Aden. Of those, 39 resulted in successful captures; 17 of those vessels and their crews -- a total of about 300 sailors -- remain in the hands of the pirates. But the seizure of the 300,000-ton supertanker Sirius Star took place well south of the gulf, in the Indian Ocean off Kenya. Pirate attacks are spreading farther north to the Gulf of Aden and farther south off the Kenyan coast, Choong said. "The risks are low and the returns are extremely high for these pirates," he told CNN. Pirates know that their chances of getting killed or captured during a hijacking are very low, he said.